Share the love. Tell your Jewish friends about us! You’ll be happy you did. They will, too. Simply have your friend put your name in the referred by box on his/her registration form and you will receive $100 off your camp fees. To assist you, we would be glad to make a camp presentation at your home, school or synagogue or give your friends a private tour of our campus. Plus, you can refer as many families as you want- there's no limit on the amount of your thank you bonuses! The family must be new to Silver Gan Israel. No cyclic referrals (families cannot refer each other) or referrals within the immediate family. New family must register by June 1st. After that time, the credit is decreased to $50. 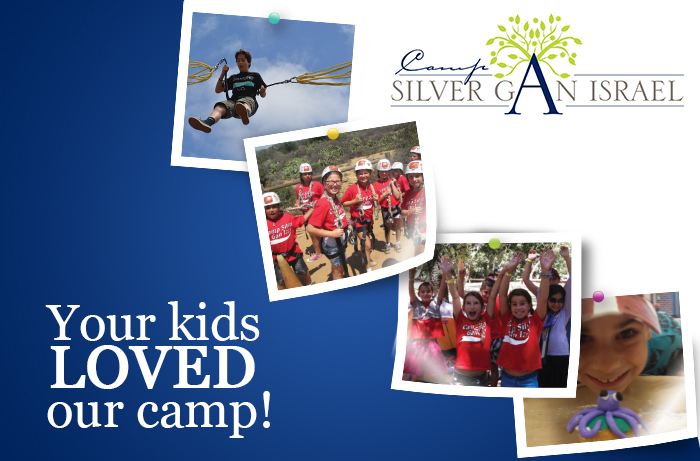 Referral credits are valid only for campers from Jewish families. The new family must enter the name of the referring family at the time of enrollment. Names cannot be retroactively applied. referral credit for a new family.